New Patient Special! $25 off Exam and First Treatment! Sign up on the form below. Treatment done on day of exam. X-Rays not routinely performed. Improve your performance & prevent future injuries. Call today. Learn more about the benefits of chiropractic care for Moms to be. Call now. NEW PATIENT SPECIAL! SIGN UP BELOW. 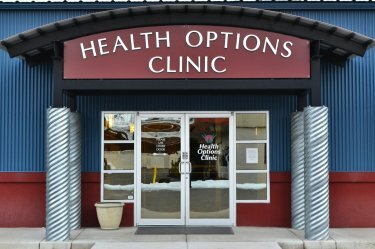 Anderson Chiropractic is a founding partner of Health Options Clinic, Montana's first truly integrative health care facility. Almost 19 years ago we realized the potential of providing a complete range of treatment protocols for our patients. Health Options professionals include chiropractors, acupuncturists a physical Therapist, a massage therapist and a clinical counselor. We also lease space to a walk in medical clinic. We provide Missoula and the surrounding community with a clinic that can address the needs of any patient seeking complimentary care. The professionals at Heath Options understand that to maximize any patient's potential an integrated approach is needed. Adding a second or third modality to the treatment protocol does not just add to the anticipated benefit but multiplies it. Dr Anderson also understands that diversity within chiropractic can also improve results. He does not attempt to fit the patient to his paradigm, but tailors care to the need of each patient. He utilizes multiple techniques including Gonstead, Diversified, Thompson and Activator, so that every patient receives the care best suited to them. He also uses Malley technique to address non spinal related issues like knees, shoulders, ankles, or even TMJ. To learn how Anderson Chiropractic and Health Options may be of benefit to you or your family please call our office at 406-721-9996. "Dr . Anderson is the best around! He genuinely cares about making you better and most importantly how to stay feeling better!" "Dr Anderson was very helpful. He explained everything before adjusting me and was very gentle. More so than my last chiropractor." "Friendly, efficient, and good results"